The popularity of poker is evident every time you walk into a casino or log into an online poker room. Here are some quick and easy tips to make you a better poker player, no matter if you’re a regular in online poker tournaments or just learning the game. You aren’t going to win every hand, so why would you waste your chips playing every hand? 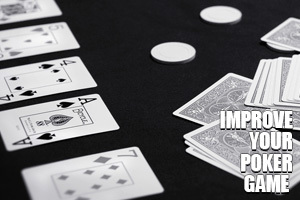 Being selective and knowing just how strong or weak your hand is – no matter which type of poker you’re playing – is a fundamental rule for players at any level. Don’t be afraid to fold from time to time, even if you’re holding an OK hand. Many times, you can get sucked into a big pot with a weak hand when you probably should have just backed down in the first place. Much of poker strategy is reading the table. If you’ve watched a player bluff and get caught a couple times, you know that there is a higher possibility of them trying to bluff their way through a hand later. If you have a decent hand and end up having to go against them, there’s a good chance they could be holding nothing. On the other side, some players don’t bother to bluff or have a strong tell when they do. Knowing or monitoring their betting behavior when attempting to bluff could save you a lot of pain and money at the poker table. Want the best FREE poker information in the biz? Of course you do! Add your phone number and email to get a SMS and email message with poker news, poker strategy and bonus offers from the best poker rooms online. * World Series of Poker and WSOP are trademarks of Caesars Interactive Entertainment, Inc. or its affiliates (collectively Caesars). CIE does not sponsor or endorse, and is not associated or affiliated with PlayOnlinePoker or its products, services, promotions or tournaments. Any promotion or tournament on this site will not guarantee your seat or ability to register for any WSOP event or any WSOP affiliated event, which is at the sole discretion of Caesars. Copyright ©2019 Play Online Poker. All rights reserved.